The morning after I landed in the serene land of Bali, I found myself spending a delightfully surprising day with a Balinese family learning about the sacred art and ritual of preparing offerings. In a pavilion next to the family’s house, I sat on a concrete floor covered with straw mats and watched the most beautiful artistry of making offerings for daily and specific ceremony days. The construction of these magical offerings is the foundation of daily and spiritual life for this wonderful culture. 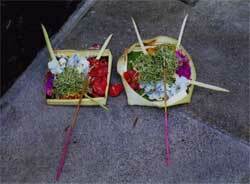 Offerings to God are an integral part of daily living for the Balinese, the majority of whom are Hindu. Offerings or blessings are made very simply but with reverence on a daily basis. Crafted out of natural materials, a simple offering might be a few inches of a green leaf of a plant (like a banana leaf) holding a small amount of rice, meat or fish and a part of a flower. Placed throughout the yard around the home, in simple thankfulness, no long drawn out ritual for the placement of the offerings is practiced, just an intention of holding the energy of blessing and connection to source before the offering is set down. More complex daily and ceremony offerings abound. Offerings are placed at the entrance to homes, at family and main temples, before and on statues, even at corners of intersections to ward off accidents and aid in protection. The offerings are then left untouched and allowed to be destroyed by the elements and animal kingdom. I soon learned that the offering preparations increase dramatically for major ceremony days which are numerous. In my 11 day stay, there were 3 major ceremony days and just a sample of major ceremony days include: the new moon and full moon celebration, six month ceremonies for young children and temples, and even celebrations for the thankfulness of all things metal (cars, appliances, coin money, etc.) How fun it was to see everyone’s car or motorbike decorated with beautiful offerings! Normally a household will have one person (usually a woman) dedicated to preparing the daily offerings, and she could easily spend an hour a day preparing and making the blessings. On the “high” days the process of preparing an adequate number of offerings can be overwhelming and may take four hours of preparation by several family members before the celebration day. Distributing them to various temples, ashrams and shrines takes additional hours. I do wish to say that although women normally prepare and distribute the offerings, the Balinese men I met were all very concerned and involved themselves in honoring and seeing that the offerings for their household were properly done and that high intentions were held for the offerings. 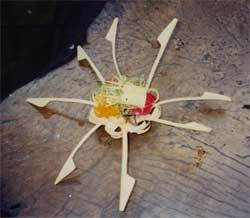 Extremely labor intensive, each offering is hand made and constructed out of palm or banana leaf, with love. When completed they are akin to exquisite origami containers that then house the actual offering. Typical flowers used in offerings are hydrangeas, plumeria, marigold, sandat and pacah – all brilliant colors that represent the chakras. Even placing the flowers in the offerings contain ritual, as one is not allowed to smell the flowers to be used in the offering, until the offering is actually made. Also offerings can include token money like Chinese coins (for prosperity), food items such as varieties of rice (cooked and uncooked white, red, brown, yellow and black rice.) Other items used are peanuts, bananas, alligator fruit, mandarin oranges, apples, cupcakes, Buddha ear crackers, Balinese oatcakes or rice crackers. Incense is lighted and placed in the offering as the blessing is made. I sat with a woman, her young adult daughter and 3 year old grandchild (who actually assisted) in making the offerings. They said that they knew perhaps 100 different individual types of offering constructions. There seemed to be protocol on what type of offering and the contents that were appropriate for each ceremony – which I’m sure, takes most of a lifetime to learn. Why do the Balinese go to such lengths to make offerings for blessings? It appeared to me that most Balinese are participating in this very special ritual out of true faith and devotion. I think there is a real desire to be thankful for all that they have, to receive and keep good fortune, to ward off disaster and allow abundance to flow in their lives. 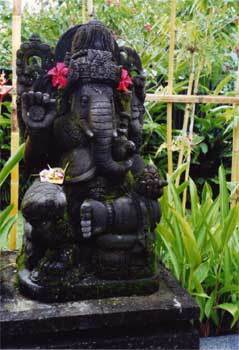 The Balinese people are rich in a spirituality that pervades their society. My brief visit into this spiritually rich culture contrasted vividly with the material simplicity in which the Balinese live. I brought back so much more from Bali than my customs form would list. Most importantly, I brought back a deep connection of serenity with the divine and I give thanks, like the Balinese, for all forms of the many blessings I have in my life.